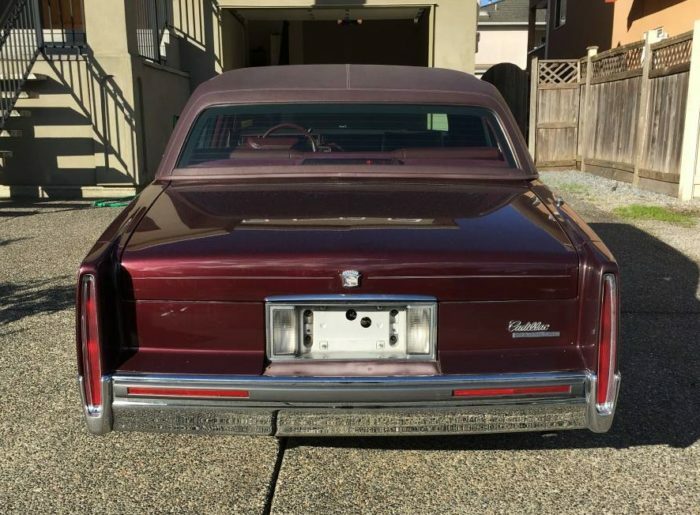 Time for a new feature here on Dashboard Light, to appear promptly whenever I feel like it: Brougham of the Week! In this most excellent new venue, I shall report on a Brougham-type motor car that is for sale and which someone should snap up should that someone be within, oh, say 50 miles of said motor car. And this week, it’s time for some Cadillac Style! For those of who who don’t know of me, I’m a simple accountant who really, REALLY likes old American luxury cars. How much? Well, I wrote probably fifty or more posts on these types of vehicles back at Curbside Classic in 2012-14, I am the co-admin over at Richard Bennett’s Facebook group, The Brougham Society, I am an admin on Edward Fiore’s most excellent FB group, The Classic Lincoln and Continental Appreciation Society, and wade into various and sundry other FB old car groups on a regular basis. Oh and I own two Lincoln Town Cars. Bottom line: I love these things. And so it was thanks to those above-mentioned connections that I learned of this fine specimen of Cadillac yesterday evening. Triple burgundy-my favorite combination! 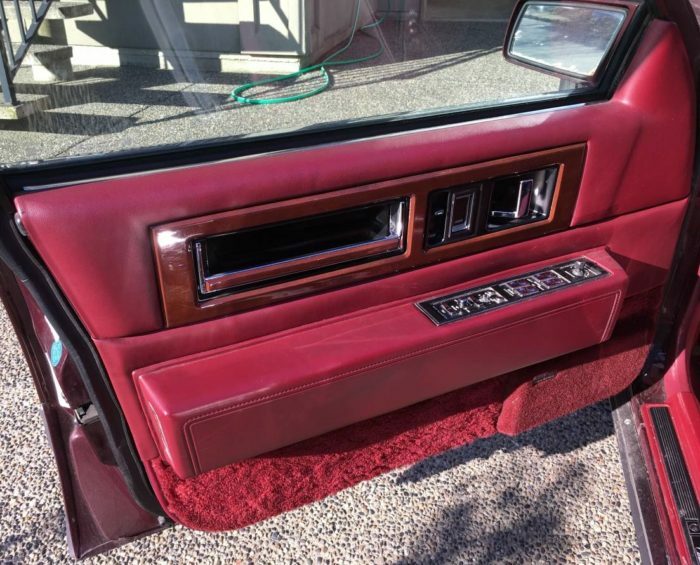 A Fleetwood with the “lawyer’s office” button-tufted seats-another plus! And only 67,200 kilometers on the clock. Which translates to under 42,000 miles. Which translates to cream puff! While it is not Elvis’s 1955 Fleetwood Sixty Special, it is still chock full of Cadillac luxury. There is no mistaking this for a Lexus or Autobahn cruiser. This is, albeit downsized, still traditional American luxury. 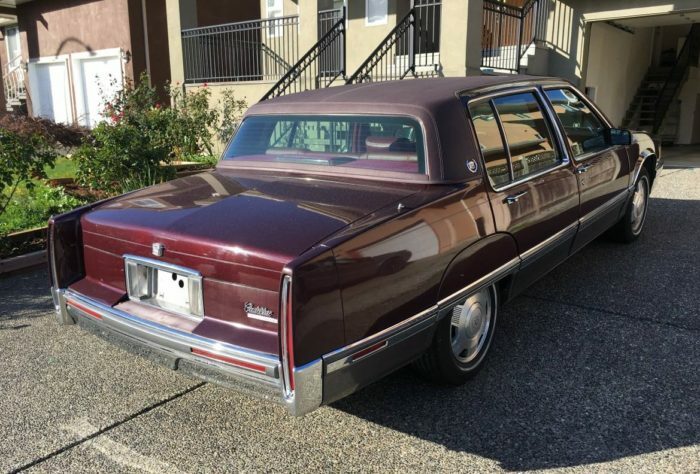 In 1992 it was as close as you were going to get to a ’65 Fleetwood Brougham, perhaps with not quite as much space or oomph, but then you now had ABS, an airbag and other safety features as well, not a bad tradeoff. 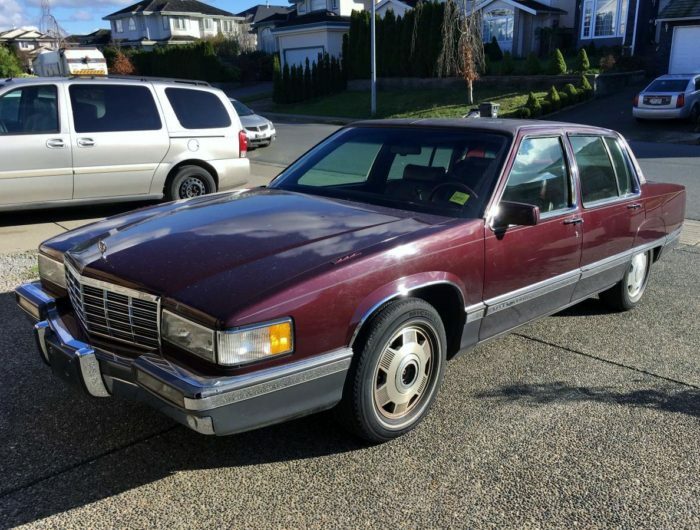 While I have never owned a 1989-93 Cadillac Sedan de Ville, Coupe de Ville or Fleetwood, I did toy with the idea of purchasing one back in the late ’90s when I was still in college. 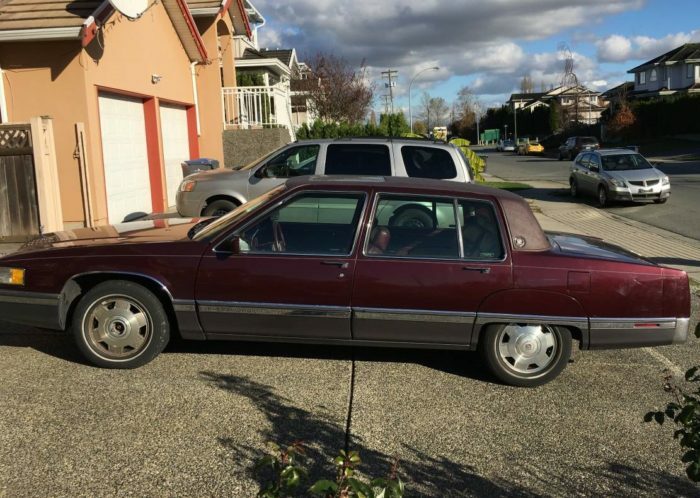 At the time it was being discussed that maybe I should move into the dorm “for the full experience.” I was not too wild about that idea, particularly because my near-pristine 1991 Volvo 940SE Turbo would be sitting outside, getting door dinged, thrown up on, etc. etc. 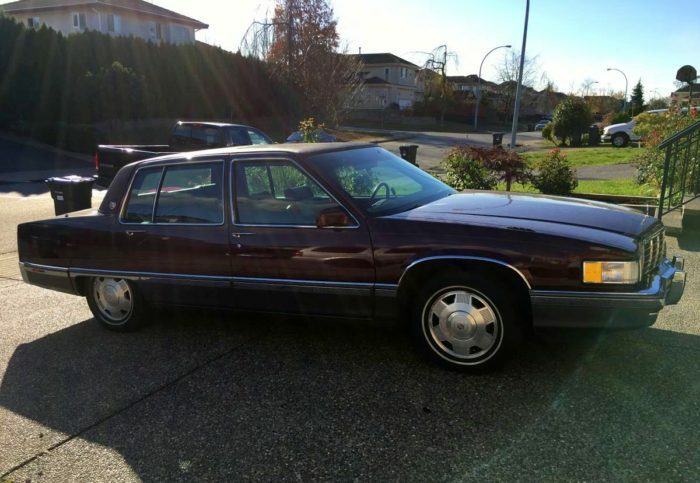 So I thought maybe a decent used car for cheap would make it more palatable. Economical, cheap and thrifty? Why sure. Now let’s go look at Cadillacs! But that was the exception to the rule. All the others I drove were excellent. Some may make fun of these downsized models, saying they’re not a real Caddy, but let me tell you, they ride and drive heavenly. The later ones with the 4.9L V8 will giddy up with no trouble, and there is tons of room inside. 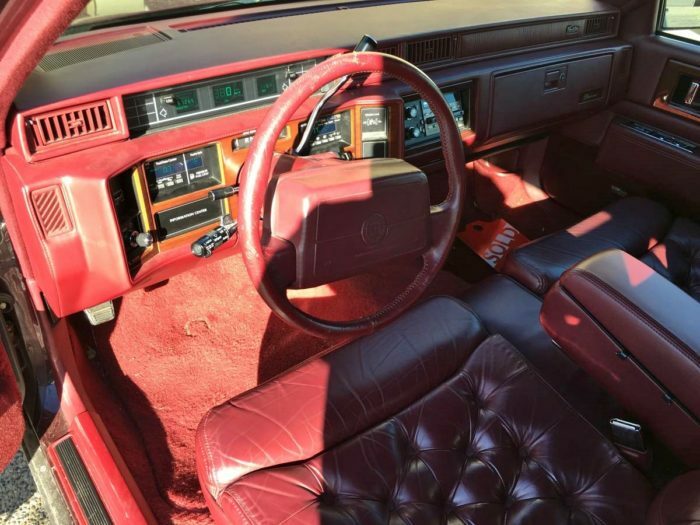 The leather seats are extra nice and cushy too. 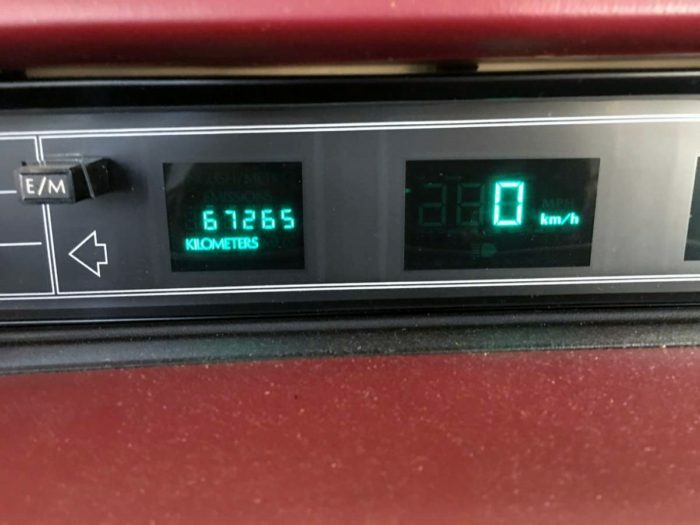 And since they’re not a 1976 Fleetwood Talisman, the mileage is much better than a 32-foot Chris-Craft Commander, parking is not really a problem, and you arrive at your destination fat and happy. Now it is in Vancouver, British Columbia (that is Canada, eh?) but if you’re nearby I would highly recommend checking this beauty out. 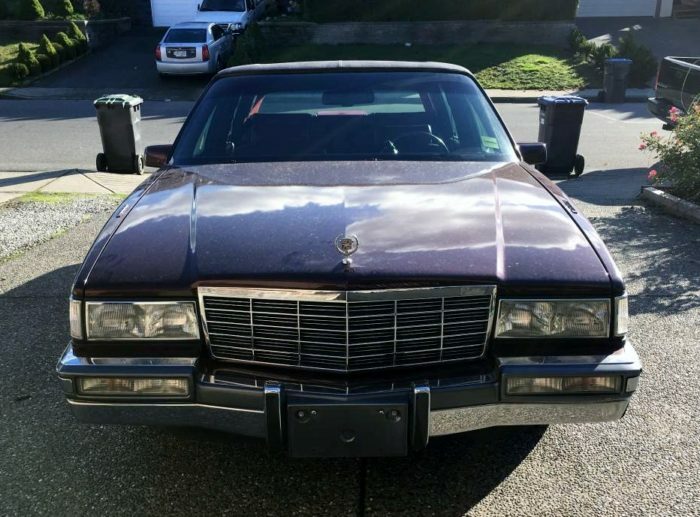 Best of all, it’s a Cadillac! Special thanks to Brougham Society member Evan Monroe for the heads-up on this fine automobile! A car nut living somewhere in the Midwest. 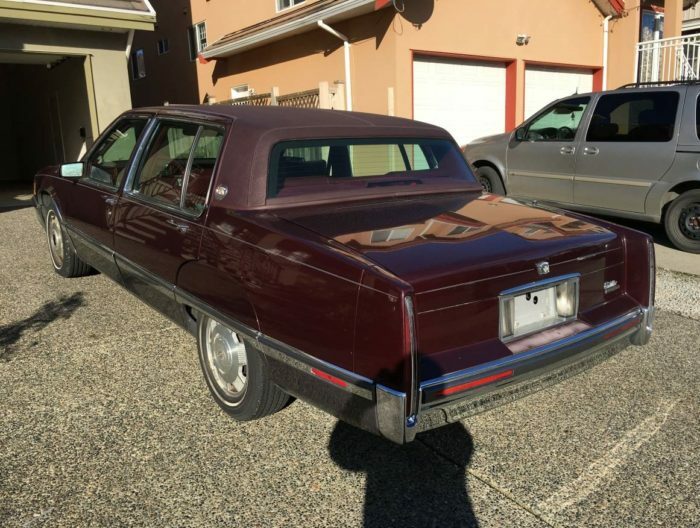 The author has particular interest in American luxury cars of the 1950s-1980s and is co-admin with Richard Bennett on the Facebook group, The Brougham Society.